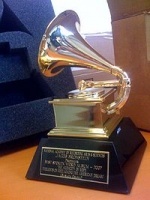 JOHN WILLIAMS a remporté 24 GRAMMYS AWARDS sur 49 NOMINATIONS. Best soundtrack album or recording or score from motion picture or television. NOMINATION. Best album of original score written for a motion picture. GRAMMY*. Best instrumental composition "MAIN TITLE" from STAR WARS. Best album of original score written for a motion picture. Best instrumental composition "THEME" from CLOSE ENCOUNTERS OF THE THIRD KIND. Best instrumental composition "MAIN TITLE THEME" from SUPERMAN. Best instrumental composition "FLYING" (THEME from E.T.). Best arrangement on an instrumental recording "FLYING" (THEME from E.T.). STAR WARS EPISODE VI: RETURN OF THE JEDI. Best instrumental composition written for a motion picture or for television. NOMINATION. "SOMEWHERE IN MY MEMORY" (with LESLIE BRICUSSE) from HOME ALONE. Best song written specifically for a motion picture or for television. NOMINATION. Instrumental composition for a motion picture or television. GRAMMY*. "MOONLIGHT" (with ALAN & MARILYN BERGMAN) from SABRINA. THE LOST WORLD: JURASSIC PARK. Best instrumental composition written for a motion picture or for television. GRAMMY*. Best score soundtrack album for motion picture, television or other visual media. NOMINATION. Best score soundtrack album for motion picture, television or other visuel media. NOMINATION. Best score soundtrack album for motion picture, television or other visual media. GRAMMY*. "A PRAYER FOR PEACE" (THEME from MUNICH). Best instrumental composition. GRAMMY*. "THE ADVENTURES OF MUTT" (from INDIANA JONES AND THE KINGDOM OF THE CRYSTAL SKULL). THE ADVENTURES OF TINTIN : THE SECRET OF UNICORN. Best score soundtrack for visual media. NOMINATION. STAR WARS : THE FORCE AWAKENS. ESCAPADES FOR ALTO SAXOPHONE AND ORCHESTRA. STAR WARS : THE LAST JEDI. SOLO : A STAR WARS STORY. * GRAMMY(S) AWARD(S) sont des marques déposer par THE RECORDING ACADEMY sous licence de la NATIONAL ACADEMY OF RECORDING ARTS AND SCIENCES.